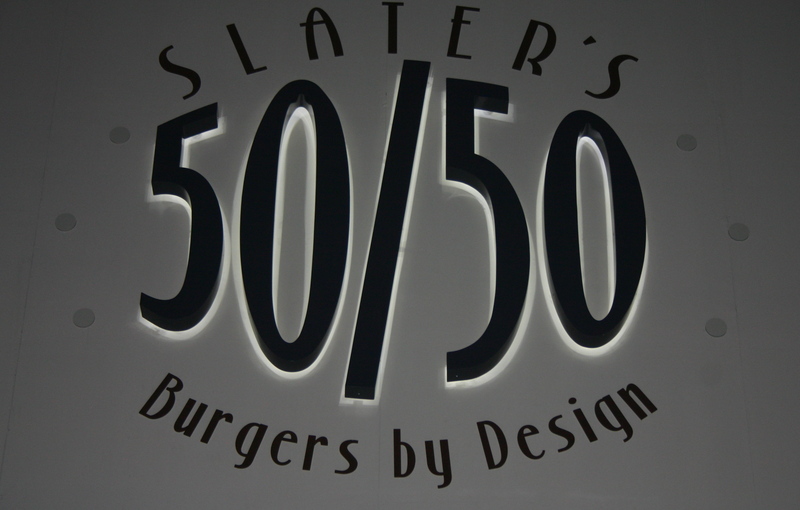 Finally, my review of Slater’s 50/50 is here… And to be honest, it’s a little lackluster. Want to know why? Because well, the burger was a bit underwhelming. This wasn’t my first time at Slater’s. I had been to the Anaheim Hills location, a year or two ago. I remember walking away from the meal thinking that the 50/50 patty that I chose for my custom burger, was a little overpowering in terms of bacon. Apparently, whatever toppings I had put onto my burger weren’t flavorful enough or just didn’t have the quantity needed to defer the intrusive flavor. The burger looks absolutely delicious. 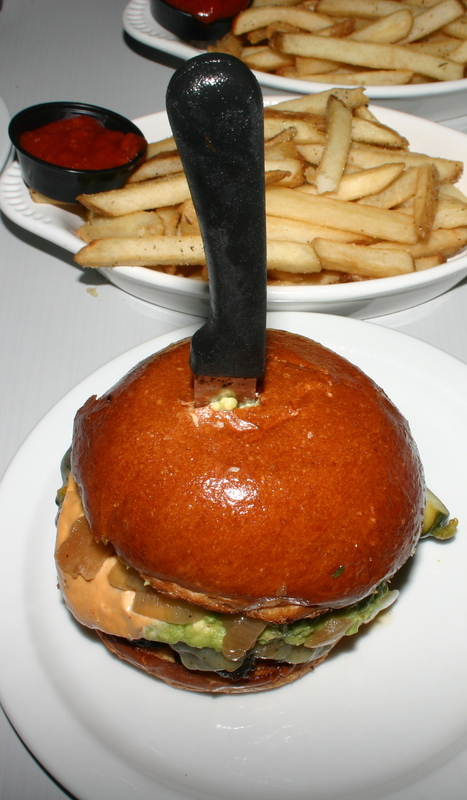 ‘I wish they wouldn’t stab my burger’, is what I think every time my burger comes out with a knife sticking into it; ‘But hey, they pass the knife test at least’. As soon as you take a slight crunch into the brioche bun, the egg greets your taste-buds. The avocado mash, mixed with the chipotle aioli creates a delightful contrast of spice and its antidote. The grilled onions add that substantial flavor that never gets dull while your mouth makes it’s transition in flavor. Sadly, that transition is for the worst. As the best part of the bite has fleeted, and all that you are left with now is a dry patty, and a dry mouth. I will say though, that this time the burger was cooked much better than the last. 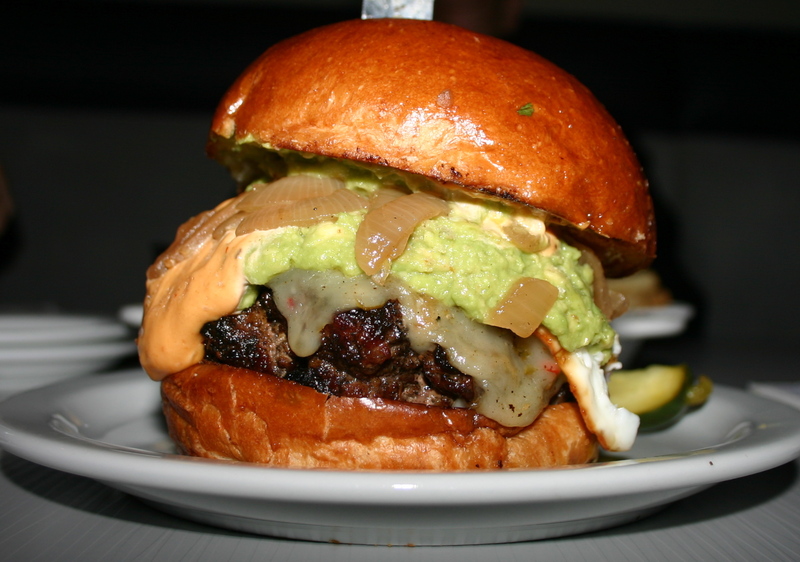 The avocado mash and chipotle aioli were phenomenal, as was the addition of grilled onions giving that extra layer of flavor to compliment both the mash and egg. Nonetheless, taking bite after bite, just one word rang loudly in my head: OVERRATED. Now don’t get it twisted, this burger was good. But it was only that… Good, average, mediocre. I just had hoped, that after two years, and after an onslaught from Slater-groupies, that this time around, I would be satisfied. Yet once again kids, hype turns its big mean grin in our direction, and slaps us in the face. A few side notes: The Vampire Dip was amazing. It’s just, well… Beware, they barely cut into the bread bowl so it looks as though you have much more dip, when they don’t give you very much from the get-go. Also, the fries were sub-par. Basic cut, with basic seasoning… Nothing to write home to mother about. However, that being said, the ranch was perfect. Thus, sliding in at #12 on THE Burger List, as well as #4 ranking on the $10 & Under List (OC), Slater’s 50/50’s, The 50/50 Burger. Special shout-out goes out to Gabriel Puzon for becoming the newest B.A. Buddy!